I'm glad you came by and checking me out further. How do I start... I'm a Penang wedding photographer? Well, okay it's no secret that everyone knows me when I'm doing my thing. I'm the Camera Man saving couples' memories every week, without the cape as I thought it's too flashy. I believe in creating meaningful and good looking photographs, and enjoy helping people to be themselves all the time. Milan Teh started from being my online nickname after I picked up digital SLR several years back as hobby. 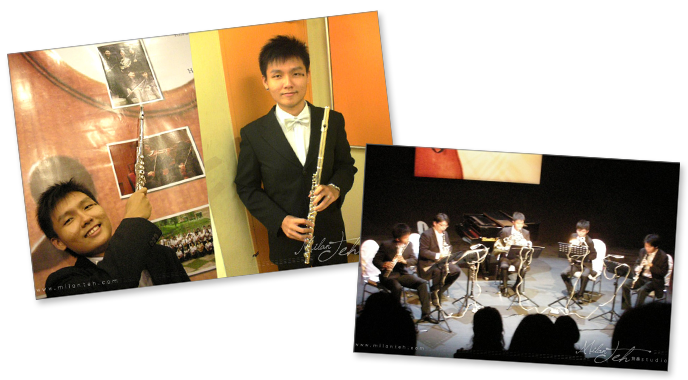 In my free time, I'm an amateur classical flute player, secretly a professional classical musician wannabe. To cut things short, I couldn't find fulfillment with my ICT degree and work life until I start to create 'that-nice-thing' through photography. Risking of having no income, I quit everything I did in life and jump out telling the world I wanted to be a full time wedding & portrait photographer in 2009. This venture brought me unexpected encounter as I were one of the youngest Asian being awarded in the internationally acclaimed competition by Wedding & Portrait Photographers International(WPPI, USA) since I was much younger at the age of 22. I'm addicted to capturing smiles and creating photographs for the heart. I'm a partial-introvert-extrovert Virgo that loves expressive music, flavorful food, tasteful art, smiles, the stars, sky & sea. Since started photography, I seem to be repeatedly creating images which I think is comfortable to view at. Also, I don't bite. Identified by people around me that my craft looks natural, I think it has something to do with the soft side of me as I believe in one couldn't be as good at what they are not. I enjoy learning and experiencing new things that would help me to become a better person or artist. 'Heartfelt & aesthetically pleasing.' is how I define my work. I like them to be authentic, to have purpose, comfortable for viewing the first, the second, the third, and countless times. This habit has lead to my love of creating picture in a series and I absolutely love to see it from the perspective of creating Photo Diary for people. All these, pretty much sums up who I am. I'd like to know you who follow my work, it's always enjoyable talking to like minded pupils, get connected with me in Facebook or Instagram. I'm offering a new category of work - Boudoir Diary. Which aims to help females re-discover the beautiful side of them they have always been, check it out if you are interested. Honored and humbled to be featured at Tatler Malaysia Weddings 2014 for what I do best. Look who I found today.